The Penguins finally got the better of Henrik Lundqvist Thursday night, and with the victory they pulled within 8 points of the Rangers in the division with 2 games in hand. Points are at a premium this late in the season, and they'll have a prime opportunity to add to their total when the 2nd worst team visits Consol Energy. The Calgary Flames are last in the Western Conference with 56 points, and they're ahead of only the Toronto Maple Leafs in the standings. It's the 2nd and final meeting between the two teams this year, and the Pens will be hoping for a better outcome than the last time, when they lost on the road to Calgary 5-2. The Flames come to Pittsburgh allowing the 2nd most goals per game (3.14 GA/gm), and the Penguins will certainly look to take advantage of what has been some awful goaltending. Karri Ramo has not had much success in the league, but he's the best option that Calgary has. Their starter has a 0.909 SV% and 2.63 GAA through 37 starts on the year, but he's out for the rest of the year after ACL surgery. It might be a blessing in disguise for the Flames to improve their draft stock as it's been a big step down behind him. Jonas Hiller and Joni Ortio have combined for just a 0.885 SV% and 3.39 GAA on the season, and Ortio will face a Pens that's scored 4 goals per game since Evgeni Malkin returned to the lineup. A year after a surprise playoff trip that came on the heels of a 77-point disaster of a season and the Calgary Flames have come back to Earth with a thud. And it's no surprise too as the underlying numbers pointed to the playoff berth being a fluke occurrence with extremely bad timing. The rest of the league was trying to tank for a chance at Connor McDavid or Jack Eichel, and the Flames managed to keep winning games despite a score-adjusted 44.3 CF%. Winning with that type of possession is unsustainable, and the bottom has fallen out this year. The possession is still bad this year (47.3 SACF%), and the goaltending is far worse, but Calgary's offense gives hope for something to build around. Calgary's offense is 11th in the league this season with 2.67 goals/gm, and a big reason why has been the play off Johnny Gaudreau. Gaudrea won the Hobey Baker Award in 2014 playing for Boston College, and he was a finalist for the Calder Trophy last season as a rookie with 24 goals and 40 assists in 80 GP. But it's his sophomore season that has him poised to jump into the ranks of the elite players in the game. With 24 goals and 39 assists he's nearly matched last season's points total through 63 games, giving him a point per game average and placing him 6th in the league in scoring. It's an unusual career path for a former 4th round pick in 2011, and along with linemate Sean Monahan (21g, 25a) they form a potent young duo that should only get better for the Flames when they reach their peak. What's interesting about the Calgary offense is how much production they get from their blueline. Mark Giordano and TJ Brodie are arguably the best pairing in the entire NHL, and they're 3rd and 4th in scoring for the Flames. Brodie (40 pts; 3.7% Rel Corsi) and Giordano (39 pts; 4.7% Rel Corsi) are also two of the biggest possession drivers for Calgary. They're such an important part of the team for the Flames, and they have both locked up long term as Brodie signed a 5 year extension last year and Giordano signed a 6 year extension this past offseason. 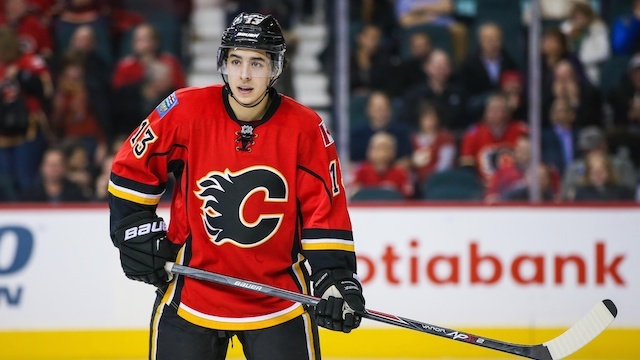 With Gaudreau, Monahan, Giordano, and Brodie in place the Flames have some top end pieces in place, and if they can find some competent goaltending and flesh out the roster a bit the future will be bright in Calgary. - Justin Schultz not make his debut for the Penguins today. Schultz has missed the past 3 games as issues with his work visa and lack of practice time with the Pens has forced him out of the lineup. - With the injury to Kevin Porter, the Penguins have recalled Josh Archibald from Wilkes-Barre to take his spot on the roster. Archibald has 8 goals and 6 assists on the season for the Baby Pens in his second season after turning pro out of the University of Nebraska-Omaha, where in his final season he was a finalist for the Hobey Baker Award ultimately won by the Flames' Gaudreau.